Copper and silver have a lot in common. Unlike most metals, they occasionally occur on their own (i.e. 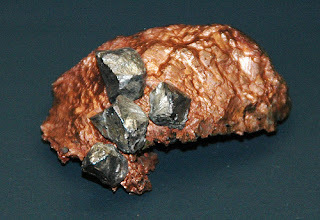 in a native metallic form) in nature. This easy access meant they were among the first metals we used to make stuff. Being easy to work, fairly resilient, and nice to look at, they've been shaped into decorative items, coins, and musical instruments. Both metals are great at conducting electricity and can readily be stretched into wires. During WWII, the extensive use of copper in the paraphernalia of war led to its replacement by silver in a couple of key manufacturing systems back at home. In particular, silver was used in place of copper to wire up aluminum smelters and to construct electromagnets for enriching uranium (as part of the Manhattan Project). Another commonality between copper and silver is their ability to kill bacteria and fungi. Pretty much every ancient civilization used the metals as a means of controlling microbial growth, usually for the purposes of preventing or treating infections. In the late 19th century, doctors began applying drops of dilute silver nitrate solutions to the eyes of very recently born babies. This was done to prevent infections, particularly conjunctivitis due to Chlamydia trachomatis or Neisseria gonorrhoea being transmitted from infected mothers to their offspring during birth. The prophylactic use of silver nitrate in newborns remains in practice in many countries. Silver nitrate (solution) and silver sulfadiazine (cream) are applied to burns and other skin wounds to prevent infections. Similarly, silver-based textiles (e.g. silver-coated nylon) are used to dress burns and large open wounds. Medical devices that are stuck inside people (e.g. catheters, endotracheal tubes, and prosthetic heart valves) can be coated with silver to inhibit their colonization by microbes and thus reduce healthcare-associated infections such as UTIs and pneumonia. During a 1832 cholera outbreak in Paris, it became apparent that copper workers were less likely to be struck down by the bacterial illness. 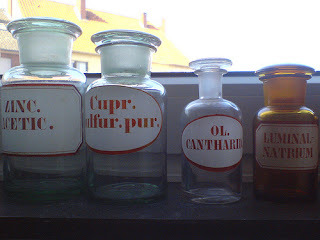 This ushered in the widespread use of copper salts for the treatment of various infections (e.g. impetigo, tuberculosis, and syphilis), which continued into the early 20th century. These days, touch surfaces such as door handles, railings, and bathroom fixtures in hospitals are increasingly being made out of the metal. In the 18th century, folks began treating crop seeds with copper sulfate to inhibit disease-causing fungi that hitch a ride on them (it's a useful way to stay alive between plant generations). Starting in the 19th century, copper-based solutions (e.g. Bordeaux mixture) were widely used in vineyards to control the growth of grape-eating fungi. Copper and silver can also be put to work disinfecting water, reducing the potential for exposure to harmful microbes via the plethora of uses we seem to have for this weirdo liquid. This is appealing because chlorine, the big cheese of the water disinfection scene, has a couple of problems with it. Chlorine is not a particularly pleasant substance to work with. It can react with bits of organic carbon in water to form harmful chlorinated compounds such as trihalomethanes. It can corrode equipment and is less effective at high temperature or pH. Finally, isn't great at killing certain pathogens like Cryptosporidium or Legionella. It's long been recognized that storing water in a copper or silver vessel makes it safer to drink. The Smith Papyrus, an ancient Egyptian medical text, mentions using copper to disinfect drinking water. Alexander the Great brought along silver containers for storing water during his efforts to conquer the world. Old Ayurvedic medical texts advise keeping water in copper or silver pots. The Aztecs, ancient Greeks, and Romans were also into this disinfection approach. American pioneers making their way west during the late 19th century dropped copper or silver coins in their water barrels to slow the growth of microbes during their travels. During WWII, Japanese soldiers did something similar, placing copper pieces in their water bottles to try and avoid dysentery. In the early 20th century, a sterilization technique was developed based on adding a small amount of silver ions to water by passing an electrical current through a submerged silver anode. Along the same lines, there is evidence that applying a weak current to silver-containing wound dressings can accelerate wound healing. Spacecraft launched by NASA (e.g. Apollo) and the Soviet space program (e.g. Mir) utilized silver ions to purify the water consumed by astronauts during their time in space. This approach is currently being used aboard the International Space Station. Water purification units based on the introduction of microbe-killing copper and/or silver ions are currently used in water distribution systems in homes, hotels, and hospitals. They can also be found cleaning up the water flowing through swimming pools, spas, fountains, and the giant tanks of water we keep aquatic mammals in for our pleasure. Notably, there are concerns with the long-term use of silver-copper ionization systems in hospitals. There's a lot of interest in using copper and silver to disinfect water consumed in developing countries. Having access to safe drinking water is incredibly important. For example, if bacteria such as Salmonella and Vibrio cholerae get into water supplies, they can end up infecting the digestive tracts of those who drink the water, causing diarrhea and other flu-like symptoms. Worldwide, diarrhoeal disease is a substantial cause of death in children. Although there are many methods of disinfecting water, most are relatively expensive and/or not easily acquired (e.g. if you're a farmer living in an isolated rural area). Just as they did thousands of years ago, copper or silver can disinfect water for a household. One technique is to store water in a copper pot overnight. Alternatively, water can be disinfected in under an hour with a device consisting of a copper screen or foil placed inside a glass or plastic bottle. These devices are fairly inexpensive, durable, don't require energy, reusable, and easily maintained. Barillo DJ, Marx DE. 2014. Silver in medicine: A brief history BC 335 to present. Burns 40(Suppl 1):S3-S8. Borkow G, Gabbay J. 2009. Copper, an ancient remedy returning to fight microbial, fungal and viral infections. Current Chemical Biology 3(3):272-278. Sudha VB, Singh KO, Prasad SR, Venkatasubramanian P. 2009. Killing of enteric bacteria in drinking water by a copper device for use in the home: Laboratory evidence. Transactions of the Royal Society of Tropical Medicine and Hygiene 103(8):819-822.